"You look at him, very smart, humble and youthful. 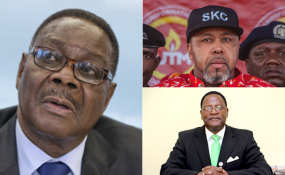 This is the right running mate for the President Professor Arthur Peter Mutharika," he said. "We need a good Vice President who is a gentleman in running the affairs of the country and we see that in you thereby giving you the necessary support you deserve. We promise to work with you," he added. "March 7, 2019 when the country was seriously hit by the disasters, other people died with most of them sustaining injuries, other people were in the capital city Lilongwe dinning and feasting. "Do you expect such people to lead Malawi? In Sena we say "Wadidi nkutani (if somebody helps you)?" Mchacha asked the multitudes of people at Nchalo responded Nkhumphedza (you help him as well)!! !